A nurse working in Accident & Emergency may see each day as an adventure. The daily work may be taxing yet also rewarding. One nurse explained this in the following way. The job is tiring. But it is wonderful to go home feeling you have done something meaningful and helped people. Different people will express the themes of adventure, application and achievement in different ways. How they do this will depend on their profession. An educator will look forward to passing on knowledge and helping the students to grow. A footballer will feel excited about playing in an important match and delivering high standards of performance. A designer will love creating things that are simple, satisfying and successful. Looking back on your own life, can you think of a situation when you chose to see something as an adventure? 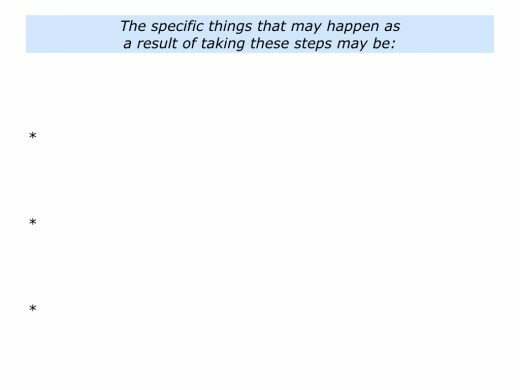 What did you do then to apply yourself to the task? 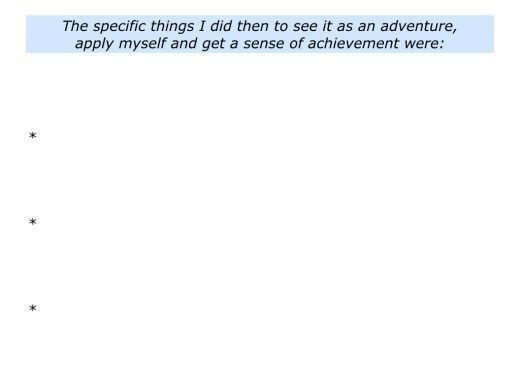 How did you get a sense of achievement? 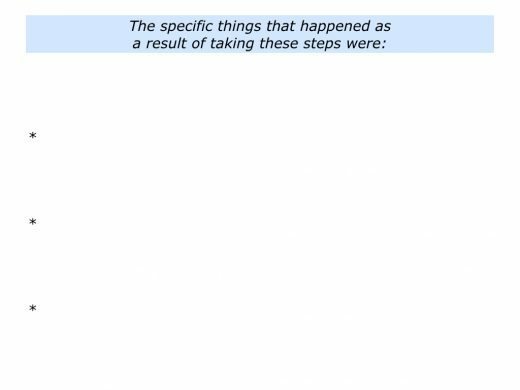 You may have taken these steps when helping a person, writing an article, renovating a house or doing another activity. You may have done so when playing a sport, leading a team, building a prototype or tackling a challenge. 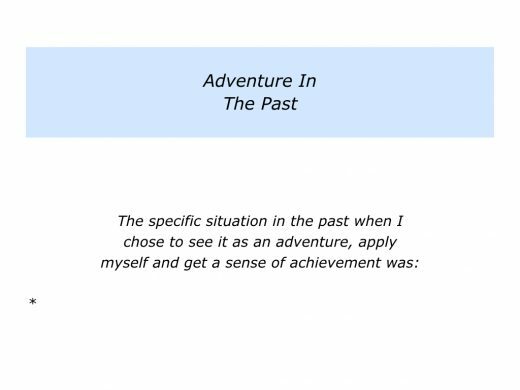 Describe a specific situation in the past when you chose to see it as an adventure, apply yourself and get a sense of achievement. 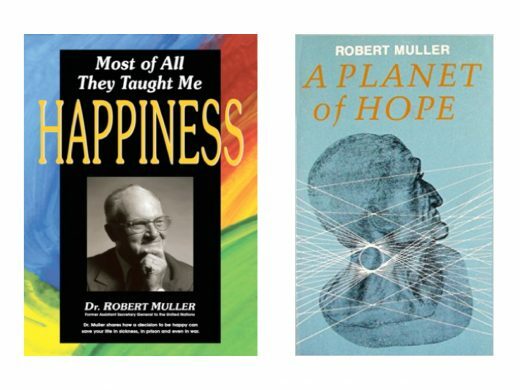 Robert Muller, an Assistant General Secretary of the United Nations, was somebody who reframed challenging situations as adventures. He adopted this approach even when his life was threatened. One day during the Second World War he found himself trapped in an attic on the top floor of an hotel that also served as an office building. Several Nazis entered the reception area and asked people where they could find Robert. How could he escape the hunters? Drawing on his positive attitude to life, Robert began thinking of creative solutions. He explained his approach in the following way. I was a great fan of Hollywood films, so I decided to see the situation as taking part in a film. I was being hunted, so how could I find a way to escape? David Gillies takes up the story in his biography about Robert called The Hatmaker’s Son. Here are excerpts from David’s book. Robert took several deep breaths. “I must overcome my fear and think rationally,” he decided. This was the moment of moments to be creative. Robert took a few minutes to consider his options. The Nazis had some idea what he looked like, but they probably had an old photo. How could he take on a different persona? They were also expecting to find a cowering student trying to hide in the milling crowds on each floor of the building. How could he be ingenious and do what the Nazis least expected? Robert settled on his plan and began to put it into practice. This involved making his way down four floors from the attic and walking out onto the street. Putting a thick file under his arm, he exuded an air of authority as he made his way from floor to floor. Nonchalantly smoking a cigarette, he passed various groups of people. Reaching the ground floor he approached a group of Nazis who were quizzing the receptionist. She chose not to recognise him, even though she was being threatened. Robert went up to the Nazis and asked what was happening. They replied they were looking for Louis Parizot (the name by which Robert was known in the building). He responded by saying he had seen Parizot on the top floor. Just like in a film, the Nazis rushed up the stairs. Robert then made his way out onto the street and rode away on a bike. Robert was sometimes asked where he had learned his positive approach to life. He described his philosophy in books such as Most Of All They Taught Me Happiness and A Planet Of Hope. Robert was strongly influenced by his grandfather. Writing in Most Of All They Taught Me Happiness, he talks about how his grandfather taught him to count his blessings. Here is an excerpt from his book. You can discover more via the following link. Through his stories he transmitted to me the wisdom he had acquired in his life. I knew that he was telling the truth, for at his age he had no axe to grind and no interest in telling me lies. He sensed that I wanted basically to know the world as a beautiful place. He knew that the world of the very young and of the very old is essentially the same, namely a world of miracles one is about to discover or to lose. We were much closer to the truth than middle-aged people. “You will never obtain everything in life, but you will always be blessed with so much. The greatest task confronting us is to determine what the right future should be. This planet must be managed so that each individual life can be a work of art. 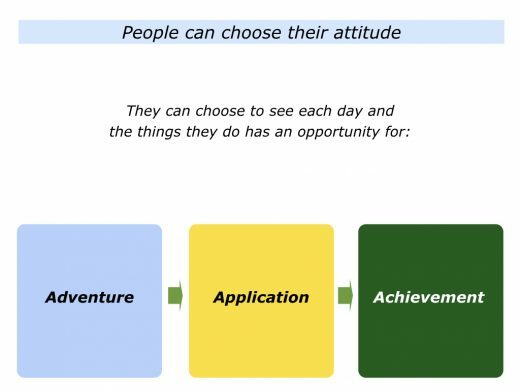 Simon Sinek has described another approach that focuses on adventure, application and achievement. He explains this in an interview he gave to the organisation called Capture Your Flag. Simon explains how athletes sometimes reframe nervousness as excitement. They look forward to the possibility of performing and doing their best. He also describes how he has adopted this approach in his own life. Let’s return to your own life and work. 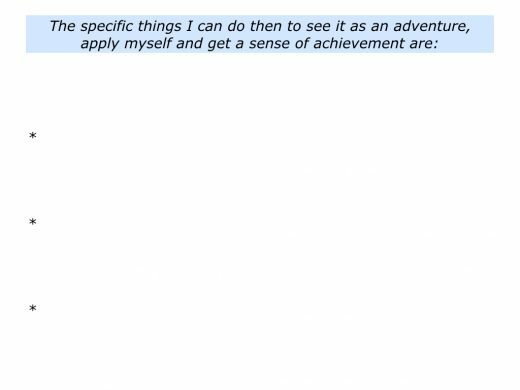 Looking ahead, can you think of a situation when you may want to focus on adventure, application and achievement? You may want to do this when helping other people, doing a creative project or tackling a difficult challenge. You may want to do it when playing a sport, giving a keynote speech, managing a transition or doing another activity. Looking at the situation, what will be your goals? Bearing in mind what you can control, what are the real results you want to achieve? What is your picture of success? How can you see the situation as an adventure? How can you prepare properly? How can you build on your strengths? How can you clarify the strategies you want to follow? How can you be fully present and apply yourself in the situation? How can you keep doing the basics? How can you, if appropriate, add the brilliance? How can you do your best to achieve the picture of success? 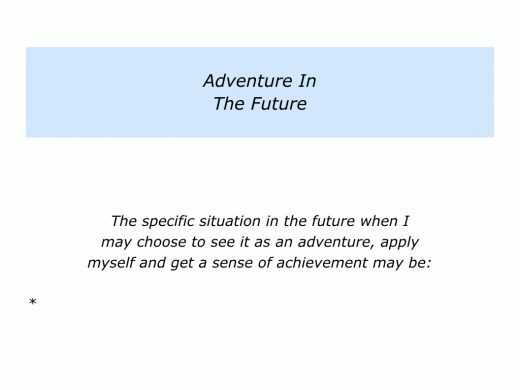 Describe a specific situation in the future when you may choose to see it as an adventure, apply yourself and aim get a sense of achievement.